The index opened positive and stayed strong for the major part of the day with an only dip below the previous day’s close bought with ease. The index closed strong at 7758.80, gain of 45.75 points. The broader market was strong with 990 advances to 572 declines. The range is now at 7500-8000. 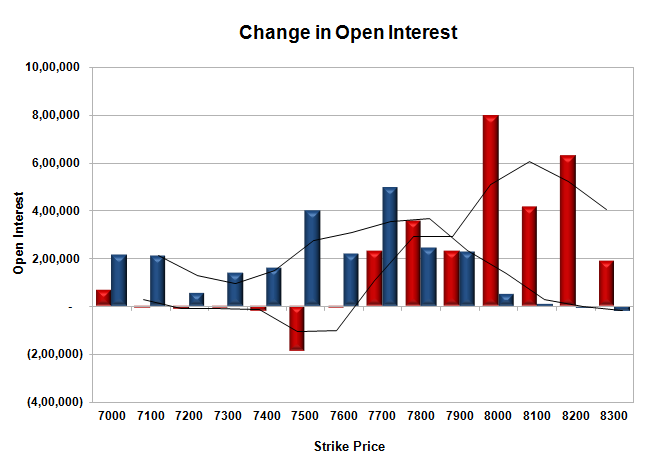 Call option 7700-8300 added 28.41 lacs OI with short covering seen at 7500 and below strike prices. 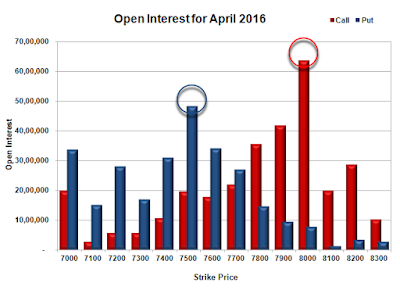 Put option 7900-7000 added 23.56 lacs OI with short covering seen at 8200 and above strike prices. Nifty Open Interest is at 1,87,72,500 up by 2,59,800, with increase in price, most probably long build-up. Bank Nifty Open Interest is at 16,37,790 down by 89,850, with increase in price, most probably huge short covering. FII’s bought 1453 contracts of Index Futures, which includes net 5964 contracts long build-up and 4511 contracts short build-up, with increase in net OI by 10475 contracts, includes 20667 longs to 19214 shorts for the day. FII’s Index future open contract as on date is 175725 Longs to 72507 Shorts, Net 103218 up by 1453 contracts. Initial support at 7700, with OI of 27.02 lacs and below that at 7600 with OI of 34.15 lacs. Initial resistance at 7800, with OI of 35.66 lacs and above that at 7900 with OI of 41.85 lacs. 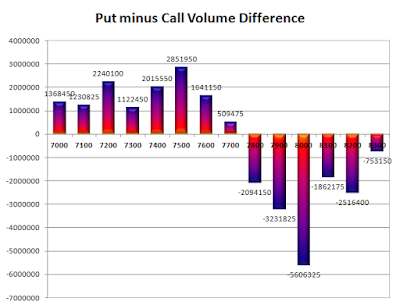 Day Range as per Option Table is 7678 - 7817 and as per VIX is 7688 - 7830 with 7743 as the Pivot.